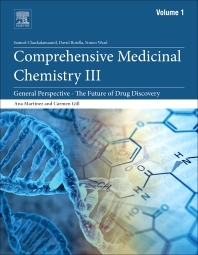 Comprehensive Medicinal Chemistry III provides a contemporary and forward-looking critical analysis and summary of recent developments, emerging trends, and recently identified new areas where medicinal chemistry is having an impact. The discipline of medicinal chemistry continues to evolve as it adapts to new opportunities and strives to solve new challenges. These include drug targeting, biomolecular therapeutics, development of chemical biology tools, data collection and analysis, in silico models as predictors for biological properties, identification and validation of new targets, approaches to quantify target engagement, new methods for synthesis of drug candidates such as green chemistry, development of novel scaffolds for drug discovery, and the role of regulatory agencies in drug discovery. Dr. Samuel Chackalamannil obtained his Ph. D. in Chemistry from Yale University in 1984 and subsequently worked in drug discovery research at Schering-Plough Corporation and Merck Research Laboratories, where he was a Distinguished Fellow when he left in 2011. Since then, he has been teaching at Ernest Mario School of Pharmacy, Rutgers University, New Jersey. Dr. Chackalamannil led the discovery of vorapaxar (Zontivity®), an FDA approved antiplatelet drug for the prevention of heart attack and stroke. His group also discovered a PDE-5 inhibitor clinical candidate dasantafil and an adenosine A2a antagonist clinical candidate for the treatment of Parkinson’s disease. Dr. Chackalamannil is a two-time recipient of the Thomas Alva Edison Award for Emerging Technology Patent and a two-time recipient of the Presidential Award for Discovery at Schering-Plough Research Institute. Dr. Chackalamannil is a co-inventor of 61 allowed US patents and numerous patent applications worldwide. He has published 82 peer-reviewed journal articles and book chapters, has co-authored a book and has given numerous lectures at international meetings and academic institutions. Dr. Chackalamannil has served as a section editor for Current Opinion in Drug Discovery and he has chaired several sessions at American Chemical Society National Meetings and Gordon Research Conference on Medicinal Chemistry. Dr. Rotella earned a Ph.D. in medicinal chemistry from The Ohio State University and carried out postdoctoral research in organic chemistry at Penn State University. He joined the faculty at Montclair State University in July 2011 as the Margaret and Herman Sokol Professor of Medicinal Chemistry after a successful career in the pharmaceutical industry. Dr. Rotella is an expert in the discovery and optimization of small molecule drug candidates for use in metabolic, cardiovascular, cancer and central nervous system diseases. His current research is focused on discovering new lead compounds for use in parasitic and central nervous system diseases. He co-edited the 7th edition of Burger’s Medicinal Chemistry and is a senior editor for the Royal Society of Chemistry’s Drug Discovery book series. Dr. Rotella authored over 40 peer reviewed articles, is an inventor on 8 issued US patents and has contributed 10 book chapters. Simon Ward has an MA in Natural Sciences and PhD in synthetic organic chemistry from Cambridge University, UK. He has a wide ranging experience of drug discovery in both large and small companies (BioCrea, GlaxoSmithKline, Knoll Pharmaceuticals, Vernalis, Chiroscience) and specialist experience of discovering and developing drugs for central nervous system indications. He has led multidisciplinary project teams & medicinal chemistry groups from target identification, through to early clinical studies, delivering multiple clinical development candidates across indications. Simon is a Fellow of the Royal Society of Chemistry. Simon is currently Professor of Medicinal Chemistry at the University of Sussex, UK and Director of the Sussex Drug Discovery Centre which he established within the University of Sussex in 2010.